We set of by tube to Hatton Cross to resume our LOOP walk. This section continues along the river Crane from where left it last week. And of course, because of that, planes were still low overhead on their way to (warmer) destinations. 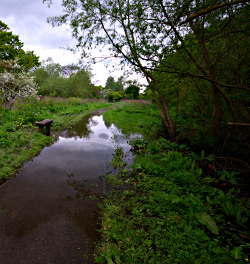 The Cranebank section of the Crane Valley Park started with 50 meters of path, that was basically submerged in two inches of water. A good way of cleaning our muddy walking booths though. Apparently there should be lots of wildlife near the river, but besides hordes of insects we didn't spot anything of interest. Coming out of the park we crossed a common and after crossing the busy Bath Road we continued along the river Crane through the Berkeley Meadows and some muddy walks into Cranford Park. We went (slightly) the wrong way, but found our way back to the LOOP near St. Dunstan's Church. Passing through the old Stable blocks near the church, and under the M4 we followed the Northern part of Cranford Park until we came upon the A437 near a very dodgy looking pub. We walked quickly past the pub, and the noisy roundabout that was adjacent to cross the bridge over the Grand Union Canal. Instead of going right at the end of a "square spiral" staircase down to the canal, we went left to have a quick look at the Bulls Bridge. Then we tracked back and continued the walk along the Grand Union Canal towards Hayes, passing the Nestlé coffee factory. 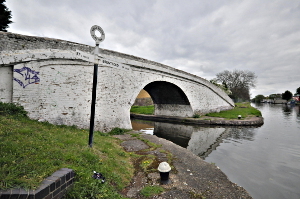 Section 10 ends at where Hayes' Station Road crosses the canal. On the same corner however is also a pub, The Old Crown where we had a quick pint before continuing the LOOP. We decided to do a small part of section 11 as well, as section 10 is rather short at only 4½ miles. Sections 11 and 12 combined are nearly 12 miles which is a bit too much for a single walk. Hence us doing a few miles along section 11. Section 11 continues for a while along the Grand Union Canal, where we spotted a lot of ducklings with their mothers. 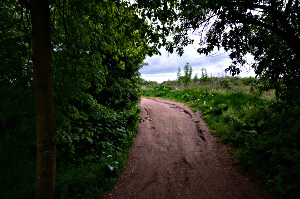 After a while we left the canal and headed for Stockley Park and past its golf course. We crossed a seemingly very unused bridge over the A408 and up a little hill to a small view point. There was however not much to view besides the park and industries in the background, and of course Heathrow with planes landing and taking off. After leaving the park we headed back for the canal to our selected end point, West Drayton station, from where we took the train back into Paddington, and home. The weather was overcast at 15°C. We got a little bit of a spray, but hardly something to whine about.